Every once in awhile, I love to pull out my teacher hat to make a fun craft or project with Emmie. I get lots and lots of fun things that her teachers help her make at school & church throughout the year, but there’s something special about going through the process of making something with her. And there’s not a much more perfect time of the year to do a few craft projects than winter break. We need something to do during the day, Emmie’s well into “school mode” (i.e. she’s bored after about 15 minutes at home), and there are so many creative ideas out there for winter activities. Yes, it takes a little bit of prep work and yes, it takes a little bit of cleanup, but it’s so worth it to see her little brain work so hard to complete something that is important to her! 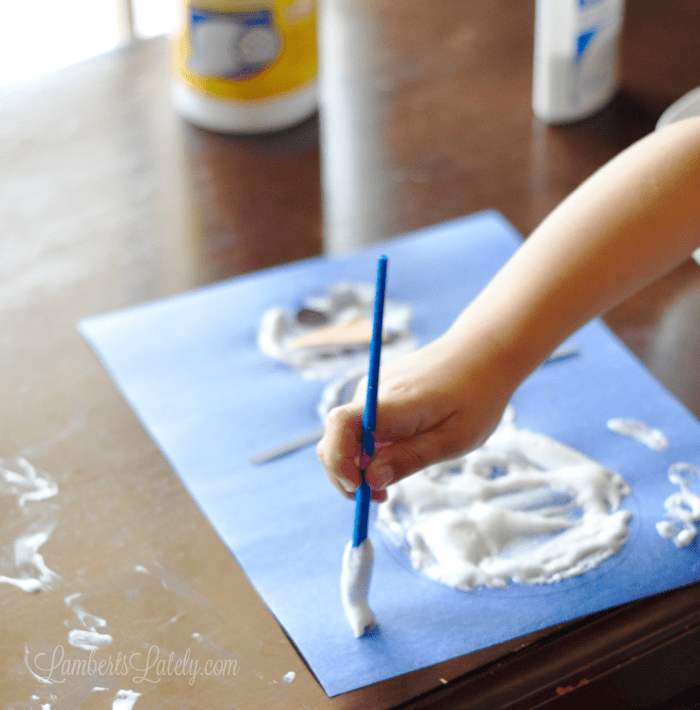 I love this Puffy Snowman Fingerpaint project we did not long ago. It’s great for her age group (with supervision, of course) and was fun for both me and her. Here’s how we did it! Gather your supplies…you’ll need a bottle of white school glue, a bottle of shaving cream, construction paper, a medium bowl (I’d recommend paper…it makes cleanup easier), and glitter (glitter glue optional…I had it on hand, so that’s what I used). You’ll also need something for cleanup…more on that later. Combine equal parts glue and shaving cream in a bowl. Mix well…your mixture should be kind of glossy when it’s all combined. Put in desired amount of glitter/glitter glue in with the mixture. You won’t be able to see the glitter very well in this mixture, but it will show up in the final product! Trace 3 circles on a piece of construction paper (I just used various size bowls from our kitchen). Older kids might not need this step, but we’re currently working on coloring inside the lines in our house, so this allowed for a little extra practice in that department. Then, let them have at it! My only rule for Emmie was that she stay inside the lines with her fingerprint. I let her put some outside the snowman for the “background” later on. Next, we stuck the pieces of the snowman on (since you’re using glue already, they attach well). Make your life easier and get a hole punch to make the pieces for the eyes/mouth/buttons. And here’s our final product! I’d recommend letting this dry on a flat surface overnight. Once dry, the paint will still be puffy, but solid (and like I said, the glitter shows much better once it’s dry). For anything that involves glue and a 3-year-old, I’d recommend something kind of heavy duty in the cleaning department. This is a fun project, but it definitely got messy for us. Clorox Disinfecting Wipes with Micro-Scrubbers were just the thing we needed! They have a scrubby texture and are more absorbent wipes, designed to disinfect 2x the surface area of regular wipes. Not only did these clean and disinfect the surface where Emmie worked, but their textured surface allowed me to scrub up stubborn glue and glitter with no problem. Clorox Disinfecting Wipes with Micro-Scrubbers knock out tough germs (99.9% of germs, viruses*, and bacteria), dirt, and grease in the kitchen too, in case you’re working on the perfect winter recipe with your little one…they really scour away tough messes that other wipes might leave behind. These are perfect for any messy Winter Break project – clean and disinfect in one step! Clorox Disinfecting Wipes with Micro-Scrubbers are available at Target in the household cleaner section. Right now, you can even save 10% with Target’s Cartwheel App! 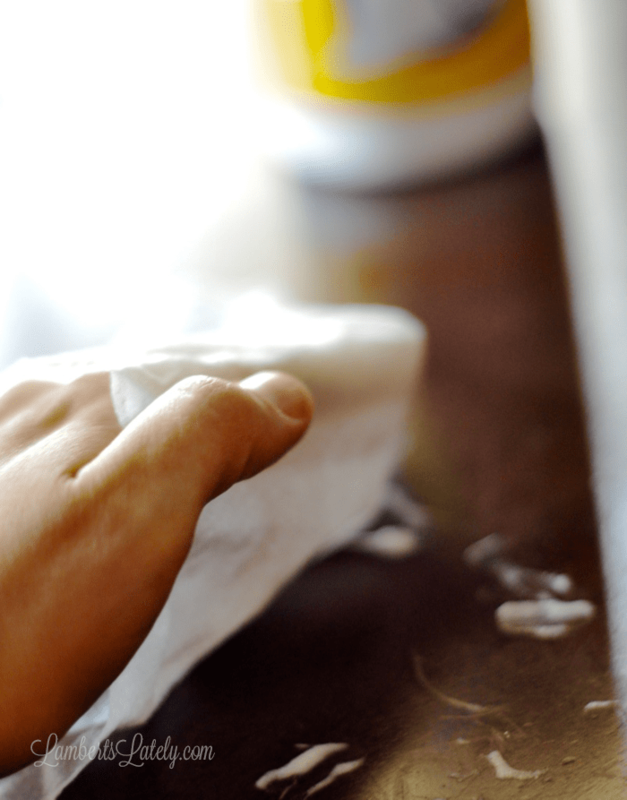 What are your favorite cleaning tips for tough household projects?